You can escape Washington, but not Alex Ovechkin – not in Sochi anyway. Greetings from Sochi, Russia, site of the 2014 Winter Olympics. The National Hockey League temporarily shutters its 2013-14 season next week to enable its players to represent their countries in Sochi, a subtropical seaside city with snowcapped mountains about an hour’s train ride away. Several of the medal-seeking countries have diverse rosters. Montreal Canadiens defenseman P.K. Subban, the son of Caribbean immigrants, and goaltender Carey Price, whose mother is a former Ulkatcho First Nations chief, are playing for Canada. Their Montreal teammate Raphael Diaz, a defenseman who’s part Spanish, is representing Switzerland. Chicago Blackhawks defenseman Johnny Oduya who’s of partial Kenyan descent, is skating for his native Sweden; St. Louis Blues forward T.J. Oshie, who is part Ojibwe is on Team U.S.A.; and Buffalo Sabres Head Coach Ted Nolan, Ojibwe/First Nations, is the Latvian Olympic hockey team’s bench boss. Ted Nolan trades Buffalo blue for Latvia’s maroon at Winter Olympics (Bill Wippert, Buffalo Sabres). Coaching Latvia is just another highlight in a comeback season for Nolan, who was an NHL coaching outcast for 16 years before the team that fired him brought him back. Latvia asked him to be the national team’s coach in 2011. “The first thing I mentioned to (national team representatives) was whether I could coach Latvia in the Sochi 2014 Olympic Games,” Nolan told the Olympic News Service. “I’m no different than most people in that I want to be in the NHL, but I wanted to coach Latvia and fulfill my obligation.” Hockey won’t be the only diverse sport in Sochi. The Winter Olympics has a rich tradition of athletes of color excelling in sports wrongly perceived as exclusively white. From 1988 Bronze Medal-winning American figure skater Debi Thomas, to 1992 Gold Medal-winning American figure skater Kristi Yamaguchi, to bobsledder Vonetta Flowers, who in 2002 became the first African-American athlete to win a Winter Olympics Gold Medal, people of color have shown the mettle at the Winter Games. Expect more of the same at Sochi. American Speed skater Shani Davis is back for another Winter Olympics, hoping to add to the Gold and Silver medals he collected in Turin, Italy in 2006, and Vancouver, Canada in 2010. Davis presents an interesting profile: Someone who’s part of the U.S. speed skating team yet apart from it. The system works for both parties. USA Bobsled team member Aja Evans. Who needs Bolt? 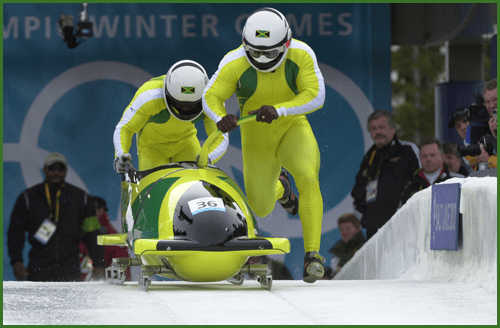 Jamaica’s back on the bobsled track. The world responded to Watt’s plea by donating $80,000 to help get him and teammate Marvin Dixon to Sochi. Michael Martinez is a young man of many firsts. He was the first Olympic figure skater to hit the practice rink in Sochi this week. He’s the first-ever Olympic figure skater to represent the Philippines. And at 17, he’s the youngest figure-skating competitor at the Winter Games. As the Philippines’ only athlete in Sochi, Martinez will carry his country’s flag in the Games’ opening ceremony. “I feel like, oh my gosh, all the hard work has paid off. I’m here,” he told Olympic News Service. “I am happy and proud to have made it. It means a lot to me. I put every effort and sacrifice into the sport.” Martinez knows he won’t win any medals. He’s just thrilled to be here. So is Dachhiri Sherpa, a cross country skier from Nepal who’s brutally frank about how he’ll do in his competition. Some folks wish that spirit extended to South Africa’s national Olympic committee. It decided not to send 18-year-old Sive Speelman, a black South African skier, to Sochi to compete in the slalom event even though he met qualifying standards under Olympic rules. But South Africa’s national Olympic committee said Speelman failed to “meet minimum requirements” for them. The organization told the BBC that it has an obligation to use only its best sportspeople in international competition. Note: For interesting and insightful news, features, sports, and entertainment stories and multimedia presentations throughout the 2014 Winter Olympics, visit McClatchy Newspapers at www.mcclatchydc.com. Thanks to Washington Capitals owner Ted Leonsis for the really nice shout-out that he gave to the Color of Hockey over the weekend on his popular “Ted’s Take” blog. The love is especially appreciated because a Washington Capitals player was partially responsible for my decision to start the blog. I fiddled around for years with the idea of writing a blog, but couldn’t figure out what to blog about. Then came Game 7 of the 2012 Stanley Cup playoff series between the Capitals and the Boston Bruins. When Capitals right wing Joel Ward scored the series-clinching goal 2:57 into overtime, it should have been a celebration of sports drama at its best – an underdog team knocking out the defending Stanley Cup champions. Instead, it showed the sad underside of some people at their worst. Several Bruins fans couldn’t handle the truth that a black man put the puck in the net and vanquished their beloved “B’s” to an early summer vacation. They responded with racist venom that oozed from their keyboards and into the social media universe. The mean-spirited emails, tweets, and Facebook posts were so bad that it prompted the NHL and Bruins organization to issue statements chastising those so-called fans. Leonsis bashed the authors of the hate-filled missives for their display of keyboard courage. The episode showed me that, despite a steady influx of people of color in hockey in recent years, a lot of folks still have a lot to learn about the history and growing influence of minorities in this wonderful game. So Ward’s goal cemented what I wanted to do in a blog: To tell an under-told story, to educate, and, hopefully, entertain people with tales about what people of all stripes are doing in hockey. Hence, the Color of Hockey. When the blog began, I had no idea how far or where it would go. You can only write so much about minorities in hockey before it gets redundant, I figured. Boy, was I wrong. From the number of minority players chosen in last summer’s NHL Draft, to Old Spice Guy Isaiah Mustafa’s passion for hockey, to the three Indo-Canadians playing for the Western Hockey League’s Everett Silvertips, to 69-year-old civil rights attorney John Brittain recounting his days as possibly the lone black high school hockey player in New England in the early 1960s, the blog has found different pathways to convey what we’re doing in the game. I’m learning that there are a ton of stories out there, from pee-wee hockey to the pros. And the readers have been a blast! I love the tweets from people who follow the blog at @ColorOfHockey – especially those from minority parents who never envisioned being inside frigid ice skating rinks with their kids at ungodly hours but are now all-in as full-fledged, die-hard hockey parents. So Thanks for the love, Ted, and please keep reading. And thank you, Joel. Please keep scoring – and reading – too. The National Hockey League’s 2014 midterm draft rankings are out and players of color populate the list from top to bottom. Forward Josh Ho-Sang of the Ontario Hockey League’s Windsor Spitfires placed highest – listed as the 18th best North American skater. Forward Keegan Iverson of the Western Hockey League’s Portland Winterhawks ranked 64th among draft-eligible North American players.Forward Jaden Lindo of the OHL’s Owen Sound Attack was graded as the 96th-best North American player. 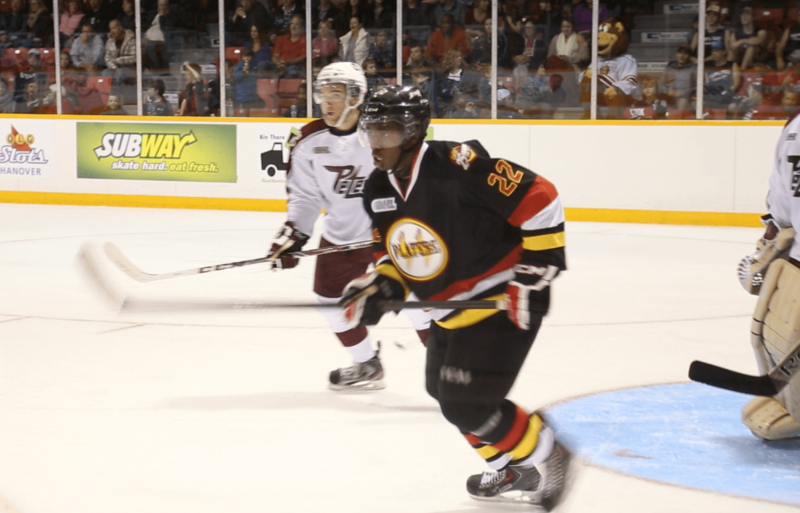 And Cordell James, a forward for the OHL’s Barrie Colts, ranked 126th among North American skaters. 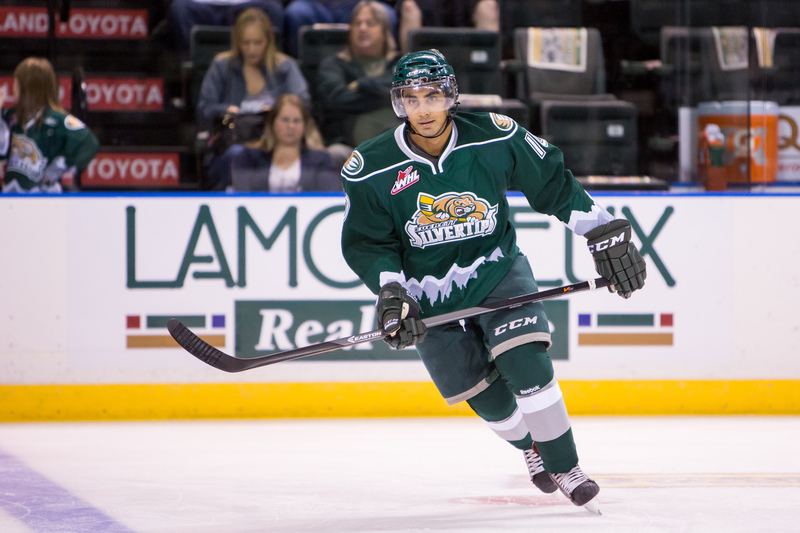 NHL scouts ranked Windsor’s Josh Ho-Sang as the 18th-best North American skater. Samuel Bennett, a forward for the OHL’s Kingston Frontenacs topped the list of North American skaters, with 26 goals and 66 points so far this season. Kasperi Kapanen, a forward for KalPa of Finland’s SM-liiga, heads the list of draft-eligible European skaters. He has four goals and four assists. The draft will be conducted June 27-28 at the Wells Fargo Center, home of the Philadelphia Flyers. Last year, eight minority players were chosen in the draft. Some hockey experts think this year’s draft could exceed that number. Some people believe that the offensively-gifted Ho-Sang could be a first or second round pick. He has 19 goals and 32 assists for the Spitfires in 42 games. Craig Button, director of scouting for Canada’s TSN, ranks Ho-Sang 33rd among North Americans and European draft-eligible players. Bob Boughner, Ho-Sang’s coach at Windsor, agrees but also noted that the young player still has some work to do. Owen Sound’s Jaden Lindo ranks 96th among North American players. “You can’t teach his skill, but he still has to learn to conform a little and make guys around him better,” Boughner told The Star. Ho-Sang, who’ll turn 18 on Jan. 22, still has some growing up to do. he was scratched for one game this season for what Boughner termed “internal discipline problems.” Ho-Sang told The Star the benching stemmed from being late for a practice. 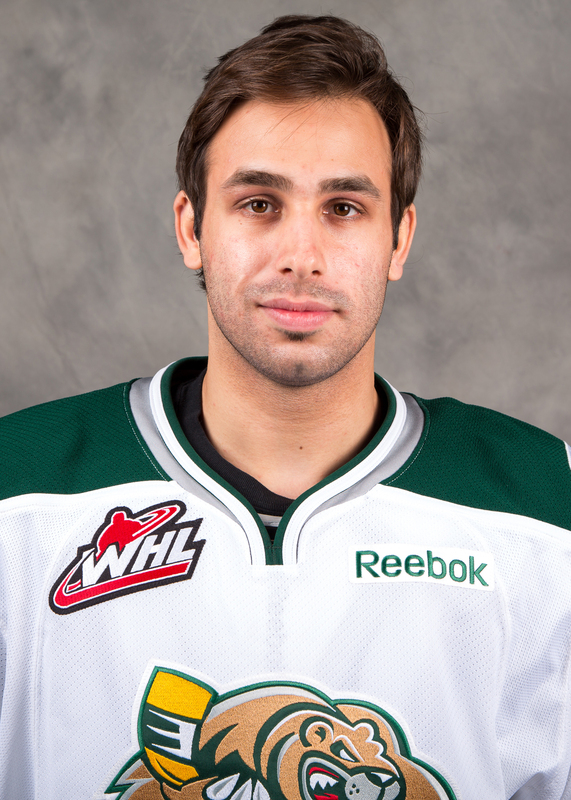 Portland’s Keegan Iverson occupies the 64th slot among North American skaters. (Brian Heim/Portland Winterhawks). Button ranks Lindo the 76th best player available. Lindo has nine goals and nine assists in 35 games for the Attack. Iverson, who didn’t make Button’s list, has 10 goals and 11 assists for Portland. 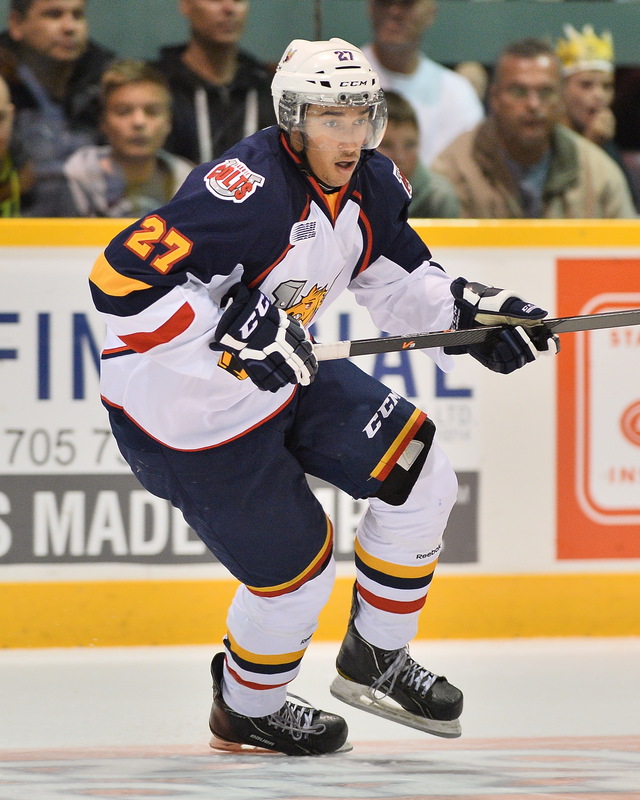 James has tallied two goals and three assists in 39 games for the Colts. File this one under the “You Never Know Until You Know” category. I was at a holiday party last December where a friend of mine was chatting up the Color of Hockey to John C. Brittain, a prominent civil rights attorney and a mentor of his. Attorney John C. Brittain grew up playing pond hockey. After hearing what the blog was all about, Brittain, a trim, impeccably-dressed, bow-tied black man with more salt than pepper in his hair, smiled. He then offered information that his protege – my friend – never knew in his decades of knowing Brittain. “I was captain of my high school hockey team in Norwalk, Conn., in 1962,” he said. It doesn’t take a historian or detective to deduce that very few black people played organized hockey in Connecticut – or anywhere else in the United States – in the early 1960s, let alone be designated as the undisputed leader of a team. But there’s Brittain in the pages of Norwalk High’s 1962 year book, kneeling front and center in the first row of the hockey team’s picture and proudly wearing the captain’s “C” on his jersey. Brittain and Norwalk High School hockey team circa 1962. Brittain learned to play hockey in the late 1950s the same way many New England kids do. Christmas presents allowed the boys to graduate to ice skates, rubber pucks and real hockey sticks, which enabled Brittain and his friends to skate and play at Norwalk’s indoor ice rink. Brittain says he never experienced problems or discrimination from Norwalk High’s coaches or his teammates. However, he remembers hearing the N-word and being called a monkey by spectators at road games played in parts of Connecticut, Rhode Island and Upstate New York. But the taunting didn’t discourage him because he knew his teammates had his back. John Brittain lets it fly in 1962. To put the hockey timeline into perspective, Brittain was playing in high school five seasons after Willie O’ Ree became the National Hockey League’s first black player in 1957-58 with the Boston Bruins and one year after O’Ree’s last NHL game in 1960-61. It would be 14 years before another black player – forward Mike Marson with Washington Capitals – would reach the NHL. Meanwhile, several talented black Canadian players who had long-toiled in the minor leagues because the NHL’s unwritten race rules kept them down were hanging up their skates. Forward Herb Carnegie, regarded by many as the best hockey player never to play in the NHL, retired in 1953. Forward Art Dorrington, who signed a contract with the New York Rangers in 1950 but never played a game with them, ended his nine-year minor league career in 1961. Brittain said he thought about playing hockey in college. But any chance of that happening ended when he enrolled at Howard University, a black college in Washington, D.C. He put down his stick and took up the causes of the turbulent of the 1960s. That “stuff” led to a distinguished law career in the courtroom and the classroom. In addition to his U.D.C. professorship, Brittain is a former University of Connecticut law professor and former dean of Texas Southern University’s Thurgood Marshall School of Law. He’s a former chief counsel and deputy director of the Lawyers’ Committee for Civil Rights Under Law, a group established under President John F. Kennedy to enlist private lawyers to take on civil rights cases at no cost. Brittain has handled several high-profile school desegregation and funding cases. In addition, he’s chair of the Norflet Progress Fund, a charitable group created by a lawsuit settlement involving John Hancock that will distribute about $16 million in grants to benefit African-Americans in education, health, and post-Hurricane Katrina relief. At 69, Brittain is a staunch vegan and a nationally-ranked masters runner. He hasn’t played hockey in decades, but he hasn’t abandoned the sport. He’s a devoted Washington Capitals fan and college hockey follower who takes his 7-year-old grandson ice skating. St. Louis Blues right wing T.J. Oshie was one of 25 American-born National Hockey League players selected Sunday to represent the United States at the 2014 Winter Olympics next month in Sochi, Russia. Blues’ T.J. Oshie lands a spot on the U.S. Olympic men’s hockey team headed to Sochi next month. Oshie, who is part Ojibwe (Chippewa), and two other Blues players join an All-Star-caliber lineup of American skaters who hope to bring a Gold Medal back from Sochi. The U.S. narrowly lost to a Sidney Crosby-led Team Canada at the 2010 Winter Games in Vancouver. Oshie, a 27-year-old from Everett, Wash., is ninth in the NHL in scoring with six goals and 27 assists in 39 games. Though it will be his first time playing in the Olympics, he brings a wealth of international playing experience to the U.S. team. He played for the U.S. at the 2006 International Ice Hockey Federation World Junior Championship and the IIHF’s 2009, 2010 and 2013 World Championships. He’ll be joined in Sochi by fellow Blues teammates David Backes, a center with 16 goals and 14 assists in 35 games, and defenseman Kevin Shattenkirk who’s scored six goals and 22 assists in 38 games. The U.S. team, led by Pittsburgh Penguins Head Coach Dan Bylsma, is a mix of youth and veterans players with Olympic experience. Thirteen members of the Silver Medal-winning 2010 Olympic squad are on the 2014 team, including Backes 2010 Olympic MVP goalie Ryan Miller of the Buffalo Sabres, forwards Patrick Kane of the Chicago Blackhawks, Dustin Brown of the Los Angeles Kings, Ryan Callahan of the New York Rangers, Zach Parise of the Minnesota Wild, Phil Kessel of the Toronto Maple Leafs and defensemen Brooks Orpik of the Penguins and Ryan Suter of the Nashville Predators. USA Hockey invited a diverse group of players to its pre-Olympic orientation camp in Washington last summer. But the organization’s brain trust passed on forward Kyle Okposo, who’s enjoying his best season with the New York Islanders, Winnipeg Jets defenseman Dustin Byfuglien, and Predators rookie D-man Seth Jones. N.Y. Islanders Kyle Okposo disappointed about not making the U.S. Olympic team. about his skating ability on the larger 200 ft. long by 100 ft. wide international ice surface even though he played on the big ice during his days at the University of Minnesota. That assessment was verified Thursday in a brutally frank tic-tock story about the U.S. team’s selection process on ESPN.com. Okposo disagreed with the talk about his skating ability. Byfuglien tantalized USA Hockey with his massive size and offensive upside with his powerful slap shot from the blue line. But questions lingered about his defensive prowess on the large ice. As for Jones, the fourth overall pick in the 2013 NHL draft, it was a matter of 2014 being too soon for the Nashville rookie. Look for the 19-year-old son of former NBA standout Popeye Jones to be in the mix for the 2018 Winter Olympics in Pyeongchang, South Korea. Oshie will be one of a handful of minority hockey players representing their countries at the Winter Games. Montreal Canadiens defenseman P.K. Subban, who won the Norris Trophy as the NHL best blue liner last season, is under consideration to play for Team Canada. Canadiens goaltender Carey Price, whose mother is a former chief of the Ulkatcho First Nations, will likely be one of three goalies chosen when Hockey Canada unveils its Olympic roster on January 7. Blackhawks defenseman Johnny Oduya will likely play for his native Sweden as he did at the 2010 Winter Games.